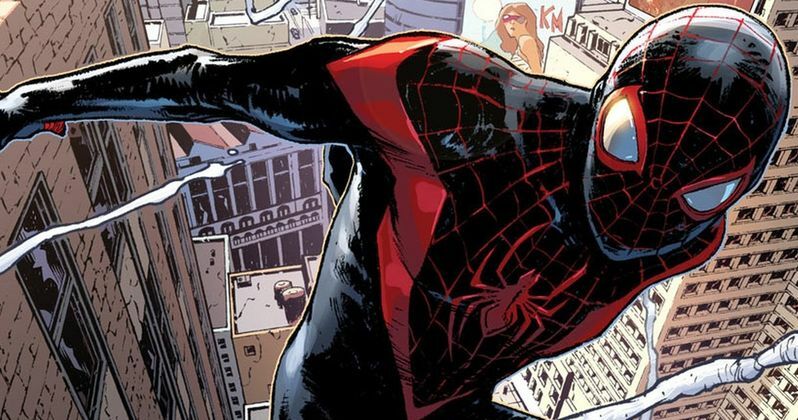 Over the summer, Marvel big boss Kevin Feige teased the existence of Miles Morales in the Marvel Cinematic Universe, claiming that the fan favorite second Spider-Man was already present and accounted for. There were hints that his shadow was looming in Spider-Man: Homecoming. Now a deleted scene from that movie's VOD release confirms he's there, just on the sidelines, waited for his moment to shine. Marvel fans get pretty excited about Easter eggs, but one of the biggest in the new Spider-Man reboot was left on the cutting room floor. The deleted scene in question arrives courtesy of the Trenzing Indonesia Youtube Channel. It prominently features Donald Glover's character, Aaron Davis. It picks up after a scene that was left in the movie, where Spider-Man has been interrogating the criminal, and leaves him webbed to his car. Davis is doing everything he can to free himself, but is unsuccessful. He eventually ends up calling his nephew. And that's a big deal. Why? Because his nephew is none other than Marvel Comic's own Miles Morales, thus confirming once and for all that Miles is part of the fabric that makes up the ever expanding MCU, and not just a character being held by Sony's stand alone Marvel Universe. It was confirmed early on that Donald Glover was playing Miles Morale's uncle. In the comics, his character is known as the Prowler. Many suspected Donald Glover Glover would somehow be connected to Miles Morales when the character was first announced. Glover serves as the real-life inspiration for Miles after a campaign to get Donald cast in The Amazing Spider-Man. When Spider-Man: Homecoming went into production, Glover was just too old to play the part. But they let him be related to the Morales family, which is a pretty cool. Kevin Feige had this to say about Miles existing in the MCU. "In the meantime, I think Miles is a big part of the animated movie that Sony's making. But where we go...we definitely want you to go '[Miles] is there. He's there somewhere.'" It sounds like Sony won't be using Miles Morales in their planned standalone Marvel Universe that will kick off with the Venom spin-off starring Tom Hardy, and will quickly be followed by Silver and Black, a movie centered on Silver Sable and Black Cat. But as Feige notes, Sony is planning a feature-length animated movie that fully revolves around Miles Morales that stands outside of the Marvel Cinematic Universe. So they get to have their own Miles movies will simultaneously sharing him with the live-action world owned by Disney. Miles Morales was first introduced in the Ultimate Marvel Universe. It takes place outside the main Marvel Comics Universe, with Miles stepping in to take over for Peter Parker after Parker is killed off. He is much younger than Peter, and is notable for being African-American and Hispanic. Not only is the character loosely based on Donald Glover, it is also partially based on former President Barack Obama. Miles Morales has been kicking around in the comics since 2011. And he has been featured in some of the animated Spider-Man shows. But Spider-Man: Homecoming is the first time he's been hinted at in a live action movie. At this time, Marvel has not announced any plans to use Miles Morales. It's possible that the kid shows up in Spider-Man: Homecoming 2. Tom Holland's Peter Parker isn't going anywhere anytime soon. And while many Marvel characters are rumored to be getting killed off in Avengers: Infinity War, one of them won't be Parker. It has already been confirmed that Homecoming 2 picks up where Avengers 4 leaves off, literally by minutes. And Tom Holland is set for a complete trilogy, which means there will be another standalone Spider-Man movie arriving two years after that. Spider-Man: Homecoming 2 arrives in theaters July 5, 2019. Perhaps we'll here more about the inclusion of Miles Morales leading up to that launch date. It will be interesting to see who is cast as the character. It will probably be an unknown, or little know teen actor who is not quite on anyone's radar just yet.